SY-LAB offers systems that permit convenient, reliable handling, labeling and retrieval of vials and bags. The SY-LAB range of inventory control systems are manufactured from anodised aluminium or stainless steel and are available in a wide range of sizes. If you cannot see the size you require we can produce the rack to meet your needs. 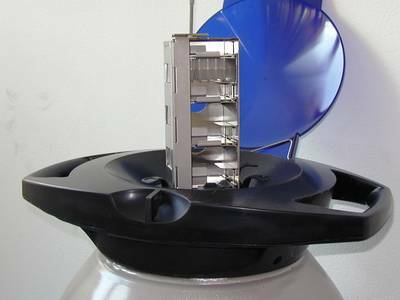 SY-LAB inventory control systems are specifically designed for different types of vessels which are part of the cryo-science technology. They accommodate standard 2ml vials. Various material combinations are available for different vessels. Other systems are also available upon request. SY-LAB offers standard Inventory Control Systems for blood bags for the storage of blood components, erythrocyte concentrates, heart valves or other materials.The systems are either fitting to the Harsco/TW LIN container range but can also be designed to any other container or refrigerator on request. 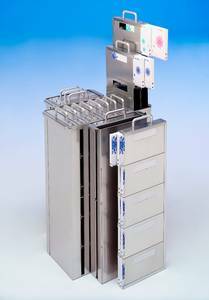 The system features aluminium design for better temperature distribution and a space saving design for maximum capacity. Cassettes from durable and coated carton offer a hygienic solution for long term storage. The boxes are made of special high-quality cardboard that retains all of its properties when immersed in liquid nitrogen. Various inventory control systems are available for standard bags. The choice of a system is based on the type and number of existing bags and the storage phase (liquid or gaseous). for the Inventory Control product line.